please dont bite my head off for this, i know this is a brand specific forum, but im sure others own or have owned other brands of speakers & was wondering what some thoughts are on them. you can compare to klipsch if you want but just curious what other members think of the many different types of speaker out there. i will start with my limited experience, sorry if this is a long read, i was bored on a cold sunday: i was first exposed to audio at a very young age, my dad had a very nice for the time console stereo system, it had 2- 12" coaxial woofers, forget the brand but they were above average for the time, & he had some nicer components, receiver, tape deck & turntable. i can remember being like 6 or 7 years old & he would sit me down & play classic rock like simon & garfunkle, beatles, rolling stones, elvis, etc & explain how you could feel the bass & the crips high notes etc. i loved listening to that console system & good early rock & roll songs. 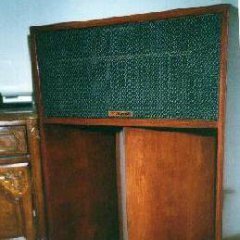 fast forward to being a broke teenager when i wanted to get my own system going, my first real speakers were MTX brand "magnum" model with a 12" woofer, 5" mid, 2" tweet & a piezo super tweeter. they were direct competition to cerwin vegas of the time but lower priced, they were very nice budget speakers for a teenager in the 1980's & flat out rocked for popular classic & heavier rock & roll music. i ran them off black faced 80's kenwood seperates with about 125wpc. my friends were amazed at the bass & i used to demo them by playing bass heavy songs, the front port would move so much air that it would move your pant leg from a quite a few feet across the room! then i "upgraded" to the later MTX AAL series with dual 12" woofers, the same mid & piezo tweeter, those were even better & had subwoofer quality bass & upper bass slam... i still have a set of the later MTX AAL series for my drum room & when i listen to them im surprised how good they sound for what they are, no true crossovers, just a cheap cap for the mid & tweet, but they have lasted for 25+ years & have very good bass & pretty good mid/tweets for what they are... a cheaper entry level loud speaker. i then upgraded to my first klipsch in the 90's with the kg 5.5 & onkyo gear, the sound quality was a big step up from the MTX, but mainly only in the mid/tweet, the bass was great too but no better than the mtx. then as i progressed in the hobby i listened to all kinds of brands & briefly owned speakers from polk, infinity, CV, mirage & even some higher end bookshelf b&w's which were sold within weeks, was not impressed with them. but then my final brand i got into in the late 90's & early 2000's after lots of demos at local audio stores & reading tons of their ads in audio magazines was definitive technology. they were formed by one of the original founders of polk & were based on a newer for the time technology called bi-polar. once i heard them i fell in love with the big open sound & then heard them for was for what was also new at the time, home theater surround sound. i was blown away at what they did for movies compared to direct radiating speakers. the sound was all around the room & made the room seem 2x bigger than it was, didnt need to sit in one spot for great sound, although the sweet spot was also excellent. for music they are very good too, with a different but very pleasing sound & no ear fatigue related issues & much more forgiving to less than ideal recordings that is common to some people with high efficiency horn loaded speakers. they are not better or worse than klipsch, just different, better in some ways, less in others. mainly, they are not as in your face or as efficient so the initial perception is klipsch have better/louder mids, but thats greatly due to the higher efficiency, easy way to address that is to simply turn the volume up on less efficient speakers to match the db, of course if your amp has the reserve power to do so. the def tech system is manily for movies & ran off a high power onkyo AVR. mains are BP-7002 with powered 12" woofers & passive radiators in each, dual 5.25" mids & 1" dome tweet in a d'appolito arrangement front & mirror image on the rear. the dual subs integrate nicely with the mains & saves a lot of floor space, but yes seperate subs are better & these are not comparable to higher dollar SVS or velodyne etc or home built subs, but very impressive for what they are. then the flagship passive model bp-30 for rears or 4 speaker 2ch stereo music, they consist of dual 6.5" & 1" dome tweet d'appolito front & rear with a transmission line ported enclosure. then smaller surrounds & a very nice center matched to the fronts. for home theater use in an average sized home environment i would match them up against many other brands costing a lot more & they do things no direct radiating speaker can, for music & movies. if you ever get a chance give them a listen. dont get me wrong, ive owned countless klipsch over the years & i LOVE my heritage/extended klipsch & will never part with them. but just like with cars or really anything else in this world, if you limit yourself to just 1 brand or model or type etc, you are really missing out, life is all about variety! thanks for reading, would like to hear other opinions of the different of speakers they have had. While I have had several other brands, I have enjoyed Boston Acoustics' A-Series (I don't know what happened to the A-40s I had in the den, as I got here with the Subwoofer). My A-150s were displaced by my La Scalas. I used Auratone 5CTVs for years as computer speakers. They are in a closet with the SA-200 that drove them after being replaced with an SA-300 and KG-2s. The 5CTVs are excellent monitors, based on the original 5C, and reproduce a vivid 3D sound image. of our music room, as a memorial to my dad, and everything he did for me. It had a nice peak at, maybe, 90 Hz that gave the music "punch." 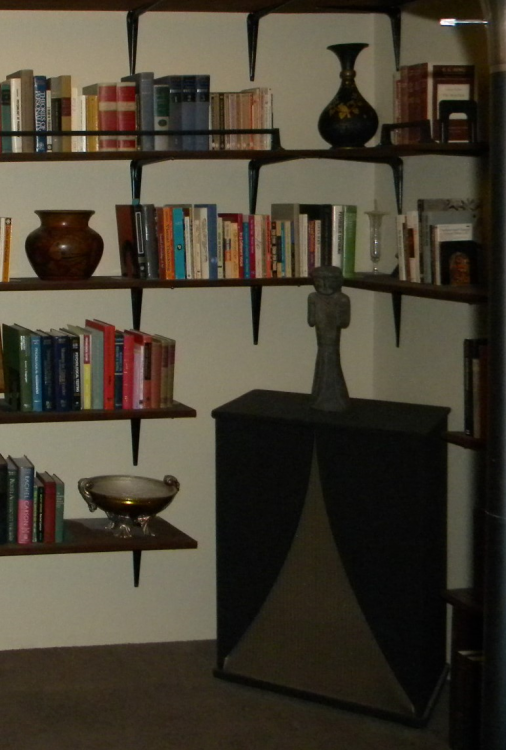 3) Same speaker complement, doubled for stereo, in twin JBL C34 corner horns. Smoother, but not quite as exciting. New Dyna Mark IV power amps, and PAS 3 preamp (lasted about 10 years at home, then 21 years of heavy use at work, with no repairs, and no tube changes. Still has been used as a back-up while newer stuff was sent off for repair), Ortofon cartridge, SME arm, Thorens TD 124 turntable, and two Crown reel to reel tape recorders. 4) A wide variety, none really better, and some notably worse. ADC, Ampex, Wharfedale, Infinity (for about 4 hours), some EVs, plus Altecs at school and work. 5) Finally Klipschorns, with Belle Klipsch center, Heresy II surrounds, Klipsch stock upgrades (AK4) put in the Klipschorns in about 2005, and the Belle fitted with a new, deeper, top hat and a K401 mid horn, to match the timbre of the Khorns, and buried in the wall, flush mounted. Sounds great with Blu-ray movies, SACDs, and some, but not all, CDs. I often play multichannel music disks, and try PLII Music with 2 channel disks, which gives me a front like Klipsch's 3 channel "Wide Stage Stereo," plus surrounds. Some of these 2 channel disks sound good rechanneled to 5 or 5.1 with PLII Music, and some don't. I'm told it depends on the kind of mic placement was used in the original recording. The Jamo's listed were pre-Klipsch ownership and sounded pretty darn good, especially for their size and design. My next favorites were the Polks that put up a hell of a fight against the Klipsch that were in my set up at that point. The 660 sub survived until it got outed by the RSW-10 a few years ago. Speakers that I had the longest are still those Aiwa 302's, but my RF-3's aren't too far behind them. In fact I think this year they'll take over as what I've owned the longest. I did Magnepans for almost as long as I’ve been doing Klipsch. I would have no reservations to going back. I would love to find a set of Apogee Grands or Duettas just for fun. My little Mini-Grands were excellent though drank current. Debating on building my own ribbons which would be fun but expensive boondoggle considering the price of large Neo magnets. It's nice to have different perspectives on music. Started with AR 2ax then altec what ever model these were,,lol Then went to LaScalas.....never turned back.lol. Enjoyed EV Interface Cs during the 80s, they were the best speakers I had owned up to that point. I currently enjoy a pair of Ohm Walsh Tall 2000s as front mains. Detailed, accurate and work very well with my current living space. Down the road...LaScalas or something from the Palladium series. You don't have to look back. Sideways works if you have the room. Owning other stuff is just interesting from a perspective. I often switch out to other speakers I have sitting around. Usually go back to the mainstays though. 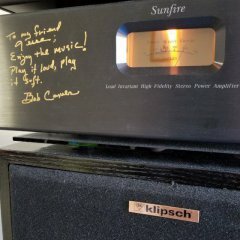 Several Klipsch (down to KLF30s, rf-82IIs, RB5s, and RP-160Ms with pair of r-12SWs or r-115SWs) and several home brews all in the name of fun. It does eat your wallet though. 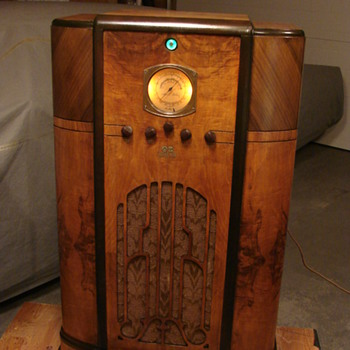 I had and really liked the Carver ALS Ribbon speakers, the Silver model. They were very nice sounding only complaint was their size and need for lots of power, my Sunfire 300x2 seemed like it barely got them going. Also had the Carver AL-III's, same 4ft Ribbon but single 10" bass driver didn't come close to the 3 -12's in the Silvers, nice sounding speakers too but need a sub IMO. I also ran the Sunfire Ribbon speakers for awhile, first the little CRM-2's then the CRS-3's, both sound very good as well but are heavily dependent on subs and proper placement and will eat a whole lot of power but not needed as much as the larger Ribbon speakers. Listened to a pair of Martin-Logan SL-3s for about an hour one day. La Scalas with an image a mile wide and 50 yards deep!. The only other speaker I know that could replace my Klipsch. The first set of speakers I owned were Panasonic Thrusters - 6.5" full range with a 6.5" passive radiator - no tweeter just a whizzer cone. Not very nice but apparently I liked the passive idea because my next purchased set were Chorus II's. In between I built several speakers and cooked off many tweeters. Now with Jubilees I am not sure where I would go next??? Tell Roy you want the passive version (drone). Another +1 on Magnepan speakers. To me the 1.7's are the best bang for the buck in their line, but any of the recent ones I would recommend. I've asked... the answers no. Martin Logan Clarity and a Theater I center channel, together with 4 Heresy and Velodyne sub. Love the Martin Logans. Yeah but the whizzer cone is where the real magic is. Maybe a horn loaded whizzer is the next level. All very nice looking speakers, many I've never heard of & most out of my price range. I've listened to many other speakers I didn't list & briefly owned a few more I didnt mention. Auditioning other brands of speakers & gear is all part of the fun of this hobby for me.